My favourite glitch hop label of the year with consistently strong releases and a roster that covers DCarls, ill-esha, Knight Riderz, Stephan Jacobs, Minnesota, Love an Light, K Theory, +verb, Freddy Todd and Sugarpill. Nuff said. 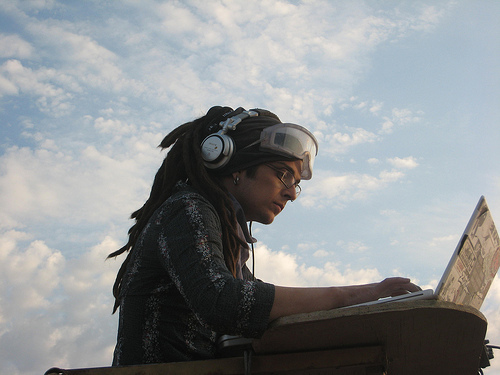 For playing more sets at Burning Man than almost all the other DJs put together. Well, not quite, but it was a stupid number. I heard 30. He's also always got time for other musicians and fans, running workshops all over the world and online. Oh.... and he's released another dope album full of collaborations. Another Ghetto Funk affiliate and he of 'Where's my Monkey' notoriety. Parker opened and closed 2011 with top notch mixtapes and has upheld a track record of solid releases throughout, both as one part of the Beekeepers and with his own remixes. I love his variety, samples and ability to move between styles - glitch hop, ghetto funk, d'n'b, dubsstep, electro swing. Plus he's a lovely guy and played a banging set for the handful people that were there to see him in Guildford earlier in the year! In the last few years Soundcloud has become the de facto tool for marketing and discovering new music to audiophiles. One half on Hong Kong Ping Pong, DJ Spinforth deserves a knighthood for his weekly Soundcloud Scour at Ghetto Funk, which he's been persistently updating since the start of the year, each edition complete with a hilarous comedy photo. Sir Spinforth we salute you!